There was little making going on this year, but I did finish up two little nightgowns and a pair of pajamas. 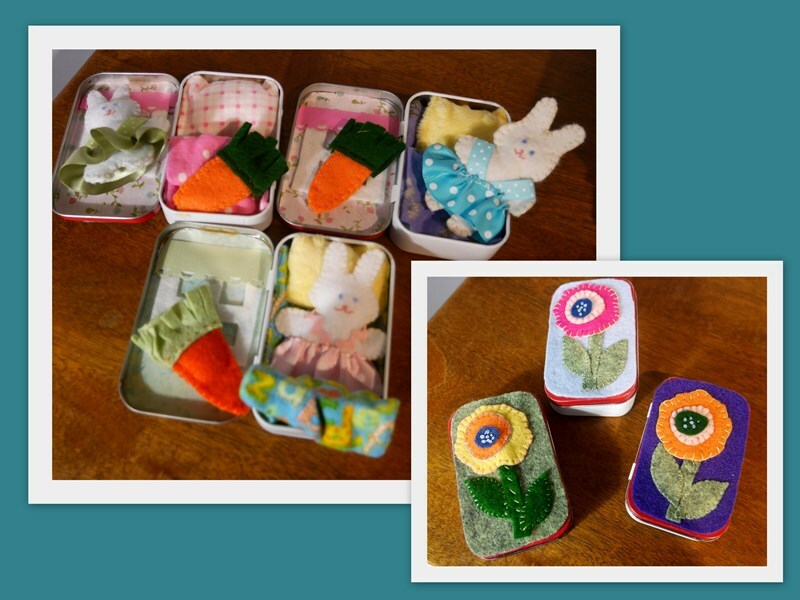 Several years ago I made one of the bunnies-in-a-bed for Miss A. I've been collecting the Altoids tins and made a few more this year. Miss A has expressed that her bunny would like a friend, so that's one. The other two are for Miss S. For Mr. F I've created a little train station for his mini Thomas and Friends. I made each of my colleagues in the modern language department (there are three of us) these cosmetic bags and placed a L'Occitane hand cream in them. A quick and easy gift. And now, I wish you all a very Merry Christmas, filled with love, joy, peace, and hope. Thank you for your many kind comments and visits this year. You inspire me, and I'm so thankful to have made friends through blogging. I just love all the gifts you've made and those bunnies in a bed are cute. Those bunnies in a bed are so cute, I know 2 little girls that would love them. Those bunnies in a bed are so cute. Too sweet! Blessings. Pretty sweet little bunnies...they will be a hit. L'Occitane continues to be my favourite hand cream...almond or the shea butter and with our recent cold snap I used up half of my current tube! Merry Christmas, Lorrie to you and Tim and all your family! Such wonderful gifts. Oh, I love those bags you made with the L'Occitane inside... My favourite fragrance is their Fleur D'or Acacia. Wishing you a very Happy Christmas. And a lovely break afterwards. Nothing compares to thoughtful homemade gifts - one of my granddaughters has just turned up with a box full of goodies made by her and her boyfriend. To know that time, care and love have been put into the present is just the best feeling. Have a wonderful Christmas with all of your family Lorrie. Lovely gifts! Oh, what small girl would not love a bunny in a bed? Adorable! The bunnies in the bed are too cute! I'm sure that your co-workers will love your pretty and practical gifts. I'm a lotion junkie and I believe that you can never have enough moisturizers! Merry Christmas, Lorrie! The bunnies in the bed are so sweet. What a wonderful gift for a little child. Wishing you all a blessed Christmas together! Those are sweet gifts...just the charming kind of thing that children love; they're perfect for car trips and imaginative play. Thank you for your sweet words...I feel the same way about you and Fabric Paper Thread. You inspire me too. I love your bags and the sweet beds for your granddaughter. Merry Christmas and Blessings to you and your family, Lorrie! What a fun idea. I know a little guy that would love the bunny in the box. I have saved a couple of those tins to do something like this. Thanks! Have a wonderful, family filled holiday. I love the bunny tins! I have seen this idea on pinterest and have been wanting to make some myself. So cute ;) I hope you show your Thomas train station. You make your projects sound so simple...though I am sure they took quite some time and effort. Beautiful! And the bunnies in a tin...such a cute idea. Wishing you and your family a wonderful and blessed Christmas! What lovely gifts - the little tins make things so much fun. I might have to try some one of these days. I've been crocheting hats for the homeless and low income local folks - so far I've made 55 - that will be 55 warmer heads this year - makes me feel warm and cozy. Merry Christmas from across the bay. Did you get any snow? We sure got it - over 3 inches, not sure it will last until christmas though. i wish you and your family a wonderful christmas. Those are wonderful gifts. Merry, Merry Christmas! Beautiful and thoughtful gifts, Lorrie. Love seeing these handmade gifts... those kinds of gifts carry little pieces of our hearts with them, I think. Hope it was a wonderful Christmas... Happy Day After! I cannot believe that I missed so many of your Christmas posts. Shame of me, but I have been busy. I hope that I can settle down and get back to normal. Love the Altoid mice. I have seen all of the things that they can be used for and they are so cute. Happy New Year. Lorrie, I've emailed this to myself. If I can get myself motivated, I want to make this clever and adorable thing for a certain little girl in my life!